At a distance of only 10-km from the famous Hindu pilgrimage Varanasi, after attaining Enlightenment the Buddha went to Sarnath. Lord Buddha had visited Sarnath looking for his five companions who abandoned him in Rajgir while they deviated from the viewpoint of Lord Buddha on self-mortification. Here in the Deer Park, he delivered his first sermon, set in motion the Wheel of Law (Maha-Dharmachakra Pravartan). 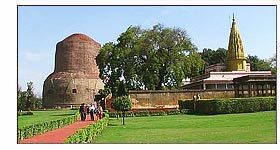 The Emperor Ashoka (c 304 - 232 BC), who spread the Buddha's message of love and compassion throughout his vast empire, visited Sarnath around 234 BC, and erected a stupa here. Several Buddhist structures were raised at Sarnath between the 3rd century BC and the 11th century AD, and today it presents the most expansive ruins amongst places on the Buddhist trail. The ruins, the museum and temple are all within walking distance. Chaukhandi: The first impression of the ancient Buddhism monuments while one enters Sarnath from Varanasi, this Chaukhandi was built to mark the meet of Lord Buddha with his five companions. Todar Mal added an octagonal tower to the structure to commemorate the arrival of Emperor Akbar to the city in 1588. Asokan Pillar - This Pillar is the national emblem of India, presents a splendid representation of art during Ashoka's period, and the Asoka Wheel down the base adorns the Tricolor national flag. The Monasteries - The Buddhist temple built only in 1931, claims to have Buddha's original relics. Moreover, the temple houses some of the most interesting mural paintings depicting the story of Buddha's life. 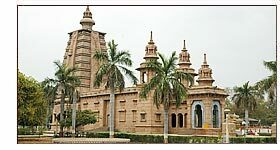 The Digambar Jain temple - Associated to Shreyanshnath, a Jain Tirthankar, this temple famous among the Jain community and good for visualizing some interesting paintings and sculptures depicting the life of Lord Mahavira. Varanasi - At a distance of 10 km from Sarnath, Varanasi, called 'Kashi' in the scriptures and popularly known as "Benaras", is said to be the oldest living city in the world with a glorious history that goes back to thousands of years. Varanasi is a revered Hindu pilgrimage, well known for the pristine Ghats, bathe rituals and the numerous temples. The golden temple, with stunning golden towers does attract majority of the pilgrims and is definitely an attraction. 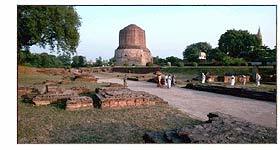 Ramnagar - If you belong to history, do visit this place, 14 km. from Varanasi. This fort and its museum are the repository of the history of the kings of Benaras. Built in the 18th century Ramnagar fort has carved balconies, open courtyards and picturesque pavilions. The Vidya Mandir museum, inside the darbar hall has a wide range of old armours, antique clocks, medieval costumes, gold & silver palanquins, silver Howdahs & jewellery on display. Chunar Fort - Associated with one of the greatest leaders Sher Shah Suri, the fort is also famous for the fact that Saint Bhatrihari had taken "samadhi" inside the Fort. Air - The nearest Airport is 22 kms from Varanasi and 29 kms from Sarnath. Varanasi is connected with Delhi, Agra, Khajuraho, Kolkata, Mumbai, Lucknow, Bhuvaneshwar and kathmandu with direct flights. Rail - Varanasi is a major station in Broad gauge network, Varanasi Cantt. and Mughal Sarai (16 km, one of the main railway stations of Varanasi) are the important rail junctions, that link Varanasi with all major cities of India. Road - Well-laid motorable roads connect Sarnath with Varanasi and other important cities.